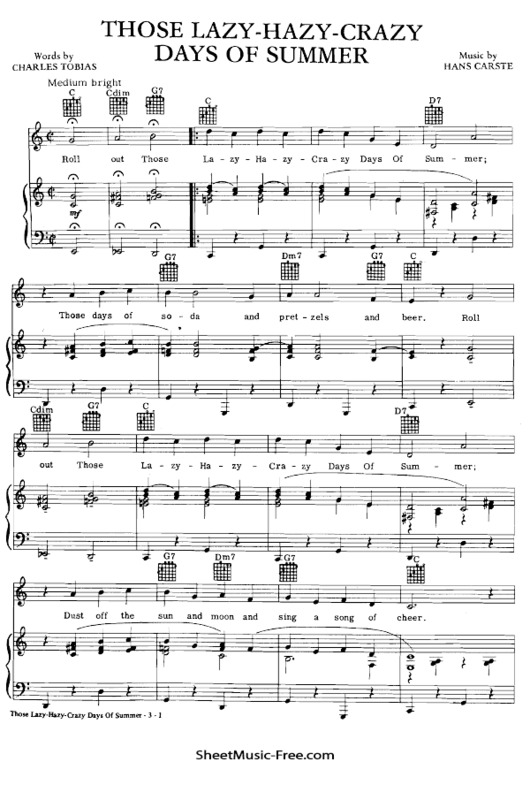 “Those Lazy Hazy Crazy Days Of Summer Sheet Music” by Nat King Cole, “ Those Lazy Hazy Crazy Days Of Summer Sheet Music” for Piano / Vocal/ Guitar Chords , Original key: C Major, number of pages sheet music PDF: 3, Video and Lyrics song Those Lazy Hazy Crazy Days Of Summer Sheet Music. “Those Lazy Hazy Crazy Days Of Summer’” is a 1963 album by Nat King Cole, arranged by Ralph Carmichael. The album reached #14 on Billboard’s LP chart. Those Lazy Hazy Crazy Days Of Summer Sheet Music Nat King Cole.